From Sept. 9-16, 2013, Colorado experienced one of its most extreme rainfall and flood events in recorded history. The storm triggered the activation of Fort Collins' Emergency Operations Center, while the City Manager issued an Emergency Declaration on the morning of September 13. 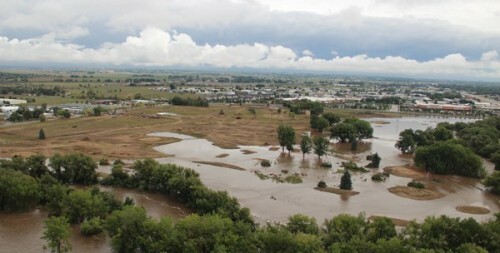 For several counties in Colorado, the event resulted in both Presidential and State of Colorado Disaster Declarations. Certain locations in Fort Collins received up to 12 inches of rain, causing the largest flood occurrence on the Poudre River since 1930. Click photos to view an interactive map of flooding on the Cache la Poudre River and in Fort Collins. The above footage was taken by Joel Cirillo on Tuesday, October 8, 2013 as crews from Fort Collins and Estes Park worked together to restore power to the town of Glen Haven. About a mile of wire was spliced and connected over three days as the crews restored power on Friday, October 11 to over 300 residents. The recent flood event on the Poudre River has substantially increased the amount of debris within the river corridor. City crews are currently working to clear debris (primarily woody debris and sediment) on public property and on public rights of way. Flood debris will be removed in cases where the debris is creating a hazard for life safety, health, general welfare, and where the debris is a threat to public infrastructure. It has not yet been determined how much debris must be removed and how long debris removal operations will continue. Call 221-6700 for questions or assistance in completing the necessary permit forms. Distribution centers are taking donations of personal items, household items, and non-perishable food for flood evacuees. Contact Timberline Church, 970-482-4387 for donation/supply needs.